The Walter Camp Football Foundation has announced its All-America Alumni NFL Offensive and Defensive Players of the week for games ending November 9. Marcus Mariota completed 28-of-39 passes for 371 yards and four touchdowns as the Tennessee Titans defeated the New Orleans Saints, 34-28, in overtime. A collegiate standout at Oregon, Mariota earned Walter Camp First Team All-America honors in 2014 and earned Player of the Year honors. 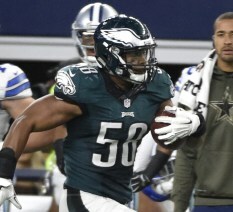 Jordan Hicks had seven tackles and one interception which he returned 67 yards for a touchdown as the Philadelphia Eagles defeated the Dallas Cowboys, 33-27, in overtime. It is the second time Hicks has earned the honor (Sept. 29). A standout at the University of Texas, Hicks earned Walter Camp Second Team All-America honors in 2014.